How to Get Rid of Mold :: My Cleaners London - Only professional cleaning! Non pourous surfaces when used with water. Porous surfaces when combined with detergent. Caution: don’t mix bleach with any product that has ammonia because it produces a toxic gas when combined. Spray, or apply with a rag to the mold, not too heavily. Wait a 5 minutes (longer for stubborn situations), then scrub with a brush, rag, or other somewhat abrasive tool, being careful not to scratch or destroy the material that you are trying to protect. Wipe clean with a damp rag. Bleach can be an effective tool for removing mold when used safely and properly. Bleach is toxic to humans, dangerous fumes, environmentally toxic when released into nature. Never mix with ammonia. Keep room well ventilated when using bleach. Bleaches fabrics! Chlorine bleach contains hypochlorite, which forces the mold proteins combine. This alters their form and destroys the mold. This is the same process that heat causes to proteins (think of how an egg changes when it is cooked). So essentially, bleach “cooks” the mold, without using heat. For more information on this process, visit this article from livescience.com. Effective in getting rid of mold and killing other microbes on the surfaces. 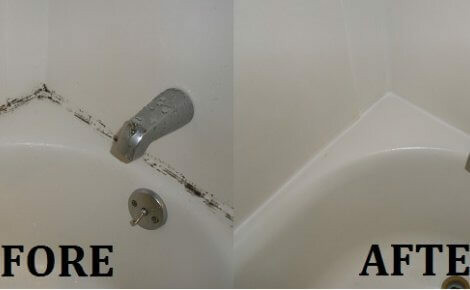 Also effective at removing stains, which is advantageous for tile grout, caulk, or other areas that need stains removed. Dangerous fumes, toxic, and does not work well with porous surfaces such as wood or drywall unless combined with a detergent. Do to bleach’s molecular structure, it only stays on the surface and doesn’t absorb into porous material unless aided by surfactants (detergents). Vinegar is a natural alternative to bleach or other strong chemicals. It is not toxic and is won’t harm the environment. Spray or apply with a rag to the mold, not too heavily. Wait 10-15 minutes, then spray or apply again and scrub with a brush, rag, or other somewhat abrasive tool, being careful not to scratch or destroy the material that you are trying to protect. Wipe clean with a damp rag. Strong odor, but will dissipate. Vinegar is acidic, with a ph of about 2.5. The acid deforms the shape of the proteins on the mold, which breaks down the mold’s structure and kills it. Natural, non-toxic cleaner. When not completely rinsed away, the low ph of vinegar helps prevent mold from returning. Not as strong as bleach or commercial products. Baking Soda is a convenient solution to mold problems. It is inexpensive, helps prevent future mold growth, and deodorizes. Any surface, but use sparingly on pourous surfaces if it can’t dry out completely. Works best on non-pourous surfaces like tile and vinyl. Spray area thoroughly and wipe with rag or scrub with appropriate semi-abrasive tool. Wipe away. Spray lightly again with the baking soda-water solution,and let dry thoroughly, the solution will naturally discourage new mold growth. This is a low-risk substance. No strong fumes or odors, non-toxic, and safe for the environment. Baking soda has a ph of about 8, which is too high for mold to thrive. The high ph not only kills mold, but discourages new mold from coming back. No toxic fumes, environmentally safe, deodorizes, inexpensive. Not as strong as bleach, commercial products, or even some other natural cleaners. Hydrogen Peroxide has multiple benefits in addition to mold removal. It also kill viruses and bacteria. It also penetrates the surface of material better than bleach, which makes it good for materials like fabric and wood. Hydrogen peroxide can help get ride of that stubborn mold — be sure to read instructions and warnings on the bottle. Straight 3% hydrogen peroxide, or 10% for difficult mold, you can also add it 50/50 to vinegar or baking soda, which will aid in preventing the mold from returning. Safe to use on all materials, both porous and nonpourous. Keep in mind that hydrogen peroxide is has a mild bleaching effect, so it can lighten colors on fabrics. Do a test spot first to see how it works. Put in spray bottle (keep out of light). Spray heavily on mold and let sit for at least 10 minutes, preferably longer. Scrub the area and wipe down. If its a fabric, place it outside in the sun to dry. Protect from eyes, and read the label on the bottle. Hydrogen peroxide reacts by releasing oxygen at a rapid rate, which in turn oxidizes the surface of the mold and decomposes it. Hydrogen Peroxide is also an antiviral, antibacterial, non-toxic, and is in-expensive and leaves no residue or fumes. Penetrates the surface of material better than bleach. Scientific studies show that bleach is a more powerful disinfectant and is used more than hydrogen peroxide in hospital cleaners, so while it kills mold, viruses, and bacteria, it may not do as effectively as bleach. Borax is the un-sung hero of mold removal. It is natural, inexpensive, and doesn’t produce toxic fumes. It is also effective at killing germs. Safe to use on all materials, both porous and nonpourous. If you are unsure about using borax, just test it out in a small area first. Apply the solution to the offending area, be careful not to use too much on a porous material that absorbs water, this will saturate the material and can cause other moisture problems. Scrub area with rag or somewhat abrasive material, such as a scrub brush until mold is removed. The level of abrasive material depends on the surface you are working with. For example, you might use a rag for leather or furniture, and a scrub brush for concrete or grout. Wipe area clean and dry the area. No need to rinse the area because borax inhibits any new growth. This is how to get rid of mold permanently, or at least delay its reappearance for a longer time. Don’t eat it, otherwise it is safe. Borox has a ph of about 9.3. Since most molds thrive in a ph environment range of 3 to 7, Borax creates an environment that kills the mold. Also, since some common molds even grow in more acidic environments (below ph 3), borax can be more effective that acidic solutions, such as vinegar. No toxic fumes or chemicals, it cleans and kills bacteria/germs, and is inexpensive.